I have finally started to get going on building the electronics of my EL84 concept amp, and am starting with the power supply. I am using a GZ34 rectifier, and the transformer is giving me 350-0-350V. In keeping with the original configuration of the old amp being "upcycled", I am putting in a pi filter, using the original 10H, 180mA, 200Ω inductor/choke, with capacitors yet to be determined (although I do have some 30μF motor start caps from the original that I could use). 60μF is the maximum in the datasheet. 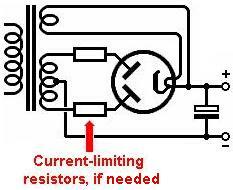 My question relates to current limiting resistors between the transformer and the anodes. Most designs I've looked at neither have them between the tf and anodes nor between cathode and first capacitor in the pi. Is this just taking a chance, or might the transformer in these cases have sufficient resistance? Anyway, according to the Amperex 5AR4/GZ34 datasheet, the minimum limiting resistor is 100Ω for a capacitor input filter at 350V. Measuring the Engels transformer, the resistance of the primary winding is 8Ω, secondaries 40Ω. This gives about 55Ω for winding resistance, and another 45Ω at least is required. If I put it on the cathode, assuming max current = 180mA (choke limit) then it needs to be minimum 1.5W, so 3-5W to be safe. The Valve Wizard gives a good digestible rundown of power supplies, and if that's too lightweight for you, there is a monumental treatise on the topic in Morgan Jones. 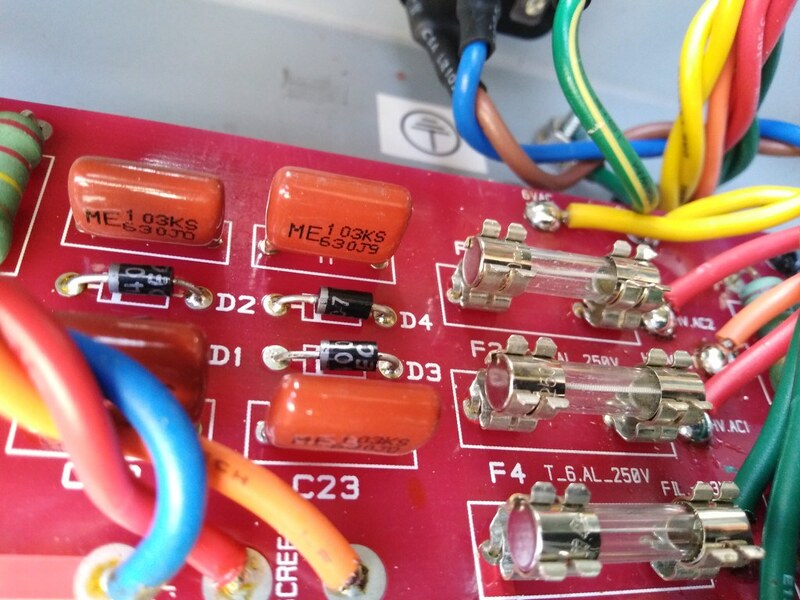 I found a good idea on The Immortal Amplifier Mod, which suggests putting two diodes (1N4007 good enough) between the transformer and rectifier anodes, which will protect the caps (and transformer itself) if the rectifier fails short circuit, putting AC onto the polarised filter caps and then problems occuring. Unless someone shows me it's a bad idea I'll do that - the diodes are 40c each. .... and when the diodes fail? The diode mod on the GZ34 is a great idea because the PIV rating of newer GZ34 is not as high (in practice) as the old stock which lasted much longer in service. When the PIV rating is exceeded, the dreaded flashover occurs which damages the valve. The diodes 1N4007 can handle a PIV of 1000v and handle that stress, allowing the valve relief of that task, hence protecting it and allowing it to carry out the task of bringing up the B+ slowly. Extends life of the GZ34. Old Mullards do well without, but newer Sov and Chinese valves benefit frm this mod. Sitting with a sparkling new Sov that flashed over with its previous owner. Maybe I should lash out another 80c and have two diodes in series? The GZ34 is a new JJ Electronic (Slov not Sov ), so good idea then. I know purists will be horrified at the thought of "sand" in a valve amp but I want to protect that old transformer. Something I've just thought of now is switching noise in the diodes - should I put caps (100nF ceramic high voltage?) across them? Yes, you want to avoid the blue flash just after switch on. I like the idea of the two resistors on the anodes of the rectifier, since there are open tags on the rectifier socket for mounting. You can also limit flashing/arcing by making the first capacitor of the PI filter smaller. Duncan's PSUD is a good tool to check designs.